Gorillaz is a side project for Blur’s Damon Albarn, and its modus operandi is to merge underground hip-hop, alternative rock, and futuristic animation. The "band" had a 2001 hit with Clint Eastwood, a song that was propelled by the playful interaction between Albarn and rapper Del Tha Funky Homosapien and featured top-notch production from Dan "The Automator" Nakamura (Handsome Boy Modeling School). Sadly, neither of them participated in crafting Gorillaz’s sophomore effort Demon Days. Instead, production duties on the new effort were handed to Danger Mouse, the underground DJ responsible for the controversial mash-up hit The Grey Album, which merged the music of The Beatles’ White Album with vocals from Jay-Z’s The Black Album. Guest rappers on Demon Days include MF Doom and De La Soul. Perhaps the biggest problem with Demon Days is that none of its songs grabs the spotlight nearly as well as Clint Eastwood did. In fact, the only tune that comes close is Feel Good Inc. on which De La Soul makes an appearance and helps to transform it into the finest selection on the album. 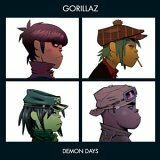 The other saving grace on Demon Days is the combination of genuinely funky guitar groove, space-y keyboards, and a children’s choir that renders Dirty Harry into a palatable track. The rest of the effort, however, is full of half-baked sonic experiments that sound like little more than rough concepts that prematurely were put on tape. This leaves Gorillaz as a cool idea that should have remained a one-time side project.